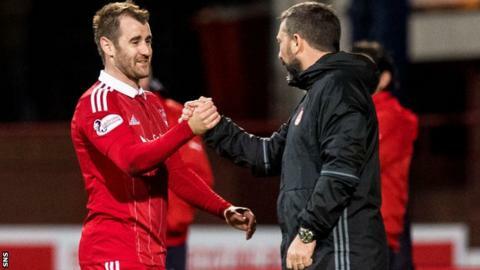 Northern Ireland forward Niall McGinn will take time to weigh up his options while he recovers from "a little hernia operation", Aberdeen manager Derek McInnes has revealed. The 30-year-old is a free agent after leaving Gwangju and Aberdeen and Hibernian are among clubs interested. McGinn spent five years at Pittodrie before moving to South Korea in July. "I think he's going to take his time over the next week or two, as is his right," McInnes told BBC Scotland. "I'm sure good players like Niall will have options. But, as I say, if we're seen as a serious option for him then we'll do what we can. "I've spoken with Niall. Niall's someone that we would always take the opportunity to work with. I love working with him. He loves Aberdeen." McGinn left Aberdeen for the K League in July, but it ended with relegation from the South Korean top flight, only five starts from eight appearances and he is now searching for a new club. He was a guest of Hibs at Sunday's 2-2 draw with Celtic at Easter Road and Hearts are also monitoring the player's availability. McInnes, who turned down the opportunity to manage Rangers last week, is now making plans for the January transfer window and may look to try to add to his squad. "We'll sit down, we have a recruitment meeting this week and we have an idea of what we'd like to do in January, in a couple of positions," McInnes said. "You put a squad together for the season. When you see the squad fully fit, as it is at the moment, we have good options. "It might come down to players not playing enough and feeling the urge to go elsewhere. "Hopefully, we can have a strong period over the next few weeks and we may feel there's not a need to do anything. It's important that we keep the standards we've set." McInnes signed Gary Mackay-Steven and Stevie May, plus Greg Stewart and Ryan Christie on loan, last summer as he tried to compensate for the departure of McGinn - and Jonny Hayes leaving for Celtic. "We've been used to having two players in Hayes and McGinn, who were at the top of the charts for all assists in the last three years in the SPFL, right across the board," McInnes said. "We don't have those types and we are playing in a different way at times with our wider players." Hearts manager Craig Levein, who has invited Inverness Caledonian Thistle winger Jake Mulraney to Edinburgh for a trial, was remaining tight-lipped about the possibility of signing McGinn. "I don't really want to get dragged into talking about individuals," he said ahead of Tuesday's match against Dundee. "We'll see what happens in January, but we do need speed in the wider areas, that's for sure. "We need a left-back and other things as well."